Silas Kirui beat all opposition and the men's course record when he won the seventh edition of the race writes Diana Rybachenko. He ran a new personal best to finish 200m ahead of his nearest rival, with defending champion Joseph Ngeny in third place. Robert Stefko, from the Czech Republic, was the first the first non-Kenyan to finish, in seventh place. "I stayed back until 15km, then I went for it" said Kirui. In the women's race Susan Kirui won by a similar margin, while local favourite Jana Klimesova finished a distant third, after recently giving birth. The second edition of the race in this 7000-year old city was sponsored by the Berdan Textile company, which employs 1100 people in the city. In cool weather and light drizzle 506 men and 47 women from 13 countries completed the race. Over 12,000 runners from 69 countries finished the race on Berlin's famous Unter den Linden writes Jorg Wenig. At the start there had been a mishap when two misdirected ambulance cars headed towards the starting field. After they performed a quick U-turn nothing further got in the way of another Kenyan clean sweep in the men's race. Eleven runners went through 10km in 28:53. Lee Bong-Ju, who had attracted a Korean TV crew to Berlin, dropped off the pace as it began to speed up, to finish 14th in 65:25. At 15km (43:07) there were only three runners still together: Paul Kimugul, Moses Kigen and former Berlin Marathon winner Joseph Ngolepus. At 10km in the women's race five women went through together in 33:25. Previous winner Joyce Chepchumba was missing, but through tax reasons. By 15km (50:09) Mary Ptikany had dropped back and by 18km Luminita Zaituc was edging ahead of her closest contender – the surprising Eun-Jong Lee of South Korea, who went on to set a national record. Stanley Leleito wiped seven minutes off his personal best time to win the third Zurich Marathon writes Diego Sampaolo. Defending champion, the Swiss Viktor Rothlin, ran a minute slower than last year to finish behind a trio of Kenyans. Claudia Oberlin upheld national honour in the women's race, taking her first career win. Salim Kipsang and Lydia Grigoryeva were surprising winners writes Pierre-Jean Vazel. At 30km only six runners were left in the hunt. As the pace picked up on the downhill sections the pack reduced first to four, then to just Paul Biwott and Kipsang. The unheralded Kipsang moved ahead in the final 2km to clinch victory with an improvement in his personal best time of nearly five minutes. After Rosaria Consolo led, a group of Africans took over into the wind, behind whom a Russian group collected. Grigoryeva made her move at 35km, and only Florence Barsosio, a former Paris winner and recently returned from maternity leave, chased her. Grigoryeva only ensured victory in the final 2km through the Bois de Boulogne. Last year's winner and world leading performer Felix Limo succumbed to the greater experience of Jimmy Muindi in the 25th Rotterdam Marathon writes Wim van Hemert. The weather did not help. After a fast start rain and a strong wind slowed everyone up after 15km (44:36) and gave leg cramps to many, including Limo. At 25km (1:15:19) there were nine runners left in the lead, including three pacemakers. After they stopped at 30km (1:30:22) only three contenders remained: Limo, Muindi and Jackson Koech, who passed 35km in 1:45:40. With 5km to go and on an incline coming through the Kralingse Bos, where the course rises from 6.5m below sea level, Muindi accelerated. Koech in his debut marathon, awaited a response from his training partner Limo. None came, and Muindi was away. He improved his best time by 36 seconds. Lornah Kiplagat, Dutch by marriage and residence, had an easy win in the women's race but was plagued by a severe cold and headache in the days before. "I had hoped to improve my personal best (2:22:22) but the second part of the race was very difficult" she said. "I'm happy with my first Dutch title." Australia's national capital produced an unseasonally warm autumn day for the 900 runners who contested the 29th edition, among them 32 foreign runners from 16 countries. Another 700 participated in the Asics Marathon Eve 5km & 10km and Kids Marathon. Magnus Michelsson recovered well from a recent hip injury to join his wife Susan as a Canberra Marathon winner. Susan won in the marathon in 2001 and, on the comeback after childbirth, settled for a win in the 10km race on marathon eve on this occasion. Three-time winner Gemechu Woyecha was runner up. Billinda Schipp made a significant breakthrough in her second marathon, taking 11 minutes off her debut time when she won Melbourne last October. World Masters Marathon champion Tracey Clissold, from New Zealand, was runner up with local runner Angela Bateup third in a personal best by over three minutes. While the women's race went as called, with an emphatic victory for home favourite Paula Radcliffe, the men's race completely overturned the form book, with the defending champion and the fastest runners in the world trailing in the lower places. Paula Radcliffe's win was not without difficulty. A highly ambitious start, with the first 5km covered in 15:47 by the three leading contenders, left all of them fatigued in the later stages. Susan Chepkemei and Margaret Okayo stuck with Radcliffe until about 8km, but even the designated pacemakers could not go with her any further. Her slowing in the later stages was only slight, and after a momentary toilet stop at 34km she sped up again. Chepkemei and Okayo fell victim to the steadier pace of Constantina Dita, although the Romanian is not know for such restraint, but they held on well for third and fourth places. Radcliffe's winning time was the third fastest ever, the other two also belong to her. It was the fastest time ever in a women-only race. The leaders stuck together far longer in the men's race, and a group of eleven passed halfway in 63:22. Last year's winner Evans Rutto tried to break the pack up by repeated surges, but with limited success. At 35km there were only six left, but Rutto himself dropped back as Martin Lel started to force the pace. With 5km to go only four remained, with the next person to suffer difficulty being world record holder Paul Tergat. Tergat urged Lel on, and he rapidly opened up a gap on World Champion Jaoud Gharib and Hendrick Ramaala. Former winner Abdelkader El Mouazziz, Olympic Champion Stefano Baldini and local favourite Jon Brown all came past Tergat, who gingerly jogged home in eighth place. A record 34,175 runners finished. Isaac Macharia surged away at 30.5km to win the 7th edition of the race while Alina Ivanova left it until 35km to do the same writes Ken Nakamura. An early lead pack of 20 men were split by Grigory Andreyev's move at 6km. Covering 5-10km in 15:19, he was 10 seconds clear at 12km. Macharia went clear of the chasing group after 15km although Andreyev kept ahead of him. By 25km the gap was up to 25 seconds, but soon afterwards it started to come down. Macharia took the lead at 30km and was ahead by 10 seconds at 33km. 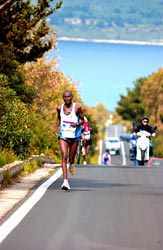 Despite slowing in the later stages Macharia kept ahead to set a new personal best. The women's lead group numbered only 5 at the start, and by 10km it was down to three. Ivanova, Lidia Simon and Derartu Tulu stayed together for the next 30km before Tulu fell back. Ivanova ran 16:55 from 35-40km and left Simon far behind for a convincing win. In the biggest marathon weekend of the year (London, Boston, and many smaller races in Germany) it was tough to get runners to the 5th iWelt Marathon and Half in Wuerzburg, but 4500 of them came (not counting the kids and the skaters). The weather was good - 10°C at the start, rising to 15°C later. The course is a scenic, flat and fast 21.1km lap throughout the 1.300-year-old historic city. In the Marathon favourite John Kiprono, got an injury early on and reached halfway in 1:16:30 to technically finish 10th in the Half Marathon. Pacemaker Eliah Sang stayed in the race and ran together with Kidus Gebremesekel Abay to 41.5 km. On the Old Bridge Sang started a furious finish to win his first marathon by 10 seconds. In the women's race, Olga Nevkapsa (Ukraine) faced no real opposition, as two-time winner Joanna Gront from Poland couldn't come to Wuerzburg. Nevkapsa easily broke the course record in a near-perfect race. Her time was 10 minutes faster than the old record. A fine day in the Ruhr region greeted a new experiment in race organisation. It wasn't too hot for running and hundreds of thousands of spectators were drawn out of their homes to support those people who participated in a range of disciplines held along two marathon courses. This was the world's first twin marathon. Two separate marathons started at the same time: one in Dortmund and the other in Oberhausen. From Oberhausen the runners ran through Bottrop and Gladbeck to Gelsenkirchen. From Dortmund, on the other side, they went through Bochum and Herne to Gelsenkirchen. After the courses converged all runners took the same route to the common finish line in Essen. So there were two male and two female winners. It was an appealing concept for both spectators and television. In Germany's most densely populated region, runners passed through eight towns and blocked five highway exits. A stage was set up in each centre so that spectators and runners could be kept fully informed about the various events. In addition to the two marathons there were handbikers, inline skaters and walkers – and the same events were also held over a half marathon distance. There was schoolkids race over 4km, a corporate race over 5km and an open 4km fun run. A total of 25,334 finished over all events, from an entry of 32,554. In the marathons the top men started in Oberhausen and the top women in Dortmund. The women started at 09.40 and the men followed at 10.00. The concept was to create a competition between the top women and men: the leading man overtook the leading woman to reach the finish in Essen only nine seconds ahead. It could have been more, but Moses Masai momentarily followed the pace vehicle when it left the course. More than 10,000 participants registered in the different events, thousands of spectators gave applause and encouragement, and a course record was set. From 08.30 in the Donaupark a never-ending stream of runners moved towards the Bridge to assemble for the start. Joyful anticipation mingled with nerves before the big adventure. For the first time, all runners waited together before the start. At 09.15 the huge field slowly moved way. Only at the front could they get up to speed immediately. The Kenyan Valentine Orare led through the first 10km in a reckless 30:20. His compatriots Benjamin Itok and Ernest Kipyego, with their eyes on a course record, followmore cautiously 40 seconds behind alongside the Ukrainian pacemaker Andrei Naumov. Orare continued his solo run onto the Donaudamm, where the waiting relay runners and spectators formed a narrow corridor and shouted encouragement to the leaders. By 18km Barnabas Kenduiywo closed Orare down. These two took turns leading and exchange a few words. The chasing group is still far behind at the Nibelungen Bridge. "I don't believe it" said one of the half marathon runners as the Africans - who have covered almost double his distance - sweep past him. Going out to Kleinmünchen, running a big loop in the Wasserwald and the along the Wiener Strasse back to the city centre, the chasing group made up ground. Orare slowed down, and Kenduiywo dropped out. At 37km, by the Barbara Cemetery, Orare was caught and then ground to a halt. The favourite Kipyego is now on his own, chasing the course record of 2:13:20 set by John Kiprono in 2002. Past the Landstrasse, the Hauptplatz, the Donaupark and the last narrow curves into the finish, Kipyego made it with 10 seconds to spare. In the women's race Tatyana Buluashenko did all her running early, to lead by 3.5 minutes at halfway. Inna Lebedeva ran the second half of the race slightly faster than the winner, but remained almost a kilometre behind her. Danilo Goffi and Beatrice Omwanza secured wins in cold and windy conditions which precluded fast times writes Diego Sampaolo. The pace set was slower from the start due to the difficult conditions. The group was paced through 10km in 30:52 and halfway in 1:05:55. The race then picked up a bit but lagged again after 27km. When the pacemaker Philip Rugut dropped out at 30km this seemed to release Goffi, who unhesitatingly took the lead and launched his attack proper after 35km. Only his training partner Francesco Bennici, in his first serious marathon, could go with him - but with 500m to go Goffi finally pulled away. A three-way contest between Rita Jeptoo, Alevtina Biktimirova and Beatrice Omwanza developed from early in the women's race. Omwanza led through 15km and halfway (1:15:12) and took control from 30km. With 3km to go she strode clear to her third career win, finishing nearly a minute clear. Along with the marathon there was a 9km fun run and the "Topolino (Mickey Mouse) Marathon" for children, over the last 1195m of the marathon. Bad weather conditions kept the numbers down to 4,000. Next year the Turin Marathon will change from its traditional spring date to 24 September 2006. Catherine Ndereba scored a record fourth win, but the men's defending champion Timothy Cherigat slumped to sixth place writes Denis Fedulov. Ndereba started as one of the 55 elite women and did not respond to the opening pace set by Lyubov Morgunova, who passed 5km seven seconds up on Nuta Olaru and Elfenesh Alemu. Ndereba was 25 seconds behind, and running her own race. Olaru and Alemu took over from Morgunova and were on course record pace early on and going away from Ndereba with every step. At 15km the defending champion was 70 seconds down, and as they passed halfway she was fully 400m behind, but leading the chasing pack. From this moment on, running with Gete Wami, she started to close. She had gained 30 seconds on the leaders by 25km, and continued to eat into their lead. She trailed Alemu, who by then had dropped Olaru, by only 28 seconds at 30km. By the top of Heartbreak Hill Ndereba had drawn level. Alemu hung in for another 3km, but Ndereba then unleashed a sustained surge from 35-40km which won her a lead of over minute, and an inevitable fourth victory. Alemu finished second for the second year in a row, although last year's defeat had been a much closer thing. A patient run through, as others faded, moved Bruna Genovese up from ninth to third place. Stephen Kiogora and Khalid El Boumili made all the early moves in the men's race. They led by 14 seconds at 10km and 23 seconds at 15km. It was not until after halfway that the pack closed them down, and at 25km they were swallowed up. Over the next 5km Cherigat made his move, but it was matched by several others. Up Heartbreak Hill Hailu Negussie and Robert Cheruiyot went clear of Wilson Onsare and Benson Cherono. Cheruiyot was broken by a second surge from Negussie while Onsare kept Negussie within sight but out of reach. Cherono, 20 years old and running his second marathon, hung on for an isolated third spot. Paul Lokira improved his personal best by five minutes to win the men's race while a late downpour stopped Ivana Iozzia improving hers writes Diego Sampaolo. The races incorporated the Italian Championships, won by Iozzia and Vincenzo Modica – who finished fourth overall in the men's race. A group of Kenyans led through 5km (15:36) while Modica and Angelo Carosi followed 10 seconds behind. Gradually five Kenyans increased their lead over the two Italians to a full minute, and passed through halfway in 1:05:10, when the pacemaker stepped aside. At 32km Lokira forced the pace and had only Johnstone Changwony and John Ngeno for company. With 2km to go Lokira increased the pace on an uphill section and quickly went away for a comfortable win. Iozzia led the race with Selomie Getnet through 10km (35:55) to halfway (1:15:48), by which time they were 69 seconds ahead. Dropping back rapidly from 23km, Getnet had lost all this lead by 29km, as Silvia Sonmaggio and Maria Cocchetti came past her. They also closed down on Iozzia, reducing her lead from 1:55 to 34 seconds over the final kilometres. It was a perfect day for running – a record 7500 competitors took part in the race on the famous Promenade des Anglais, flanked by the sea and palm trees, and in an atmosphere of continuous carnival. All along the course, a crowd of 30,000 people stood cheering the runners and enjoying the festivities in the streets of the beautiful capital of the French Riviera. Keenly anticipated, the race attracts increasing numbers year after year. The flat course allows ambitious runners to achieve good times. Benson Barus broke Julius Rotich's 2004 course record by 13 seconds. Local runner Miloud Sendjasni finished as first Frenchman in 14th place, while Zaia Dahmanimade the podium. The men's lead group broke up in the tenth kilometre, while not until 3km to go did Barus' progressively increasing speed get him clear of his compatriots. Irina Permitina quickly took over the women's race to finish ahead of favourite Nouriah Asiba. Julio Rey won the Hamburg Marathon for the third time, while in the women's race there was a winning debut for three-time World Cross-Country champion Edith Masai writes Jorg Wenig. Rey missed his own course record by only 11 seconds, which was probably no less than what the stiff wind cost him. He led from soon after halfway, with the pacemakers unable to help him beyond that point. Edith Masai, making her marathon debut at the age of 38, showed confidence right from the start. She built up a big lead and looked like beating Katrin Dorre's six-year old course record of 2:24:35, but the wind slowed her in the later stages and she missed the mark.